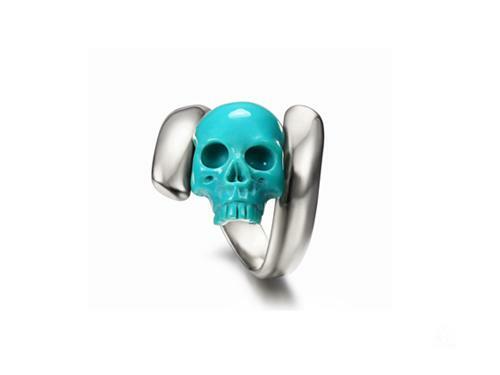 You are looking at a Turquoise skull ring. A good general healer for all illnesses and excellent conductor (high copper). Speech enhancer, Friendship, Communication, Healing. This gentle, cool, soothing stone is a Native American classic. It opens the Throat Chakra, for open communication, creativity, serenity, spiritual bonding, upliftment; Opens the Heart Chakra for giving/receiving. Symbolizes our source (spirit/sky) and spiritual love for healing, help. On brow: Psychic connection to great spirit. Strengthens and aligns all meridians, chakras, and energy fields. Like amethyst, it protects and detoxes from alcohol, poison, pollution, x-ray/sun radiation. 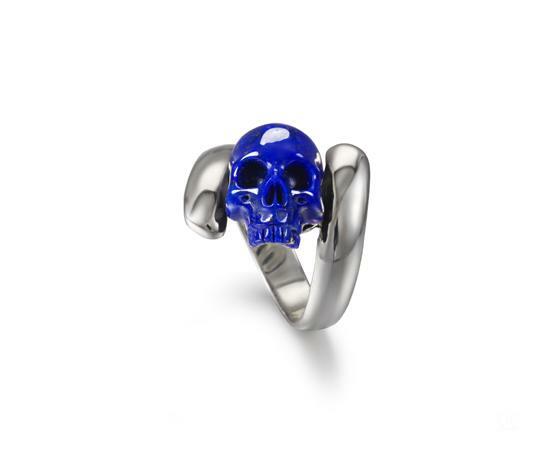 Ancient absorber of "negativity"; protection from "evil eye." Brings wisdom. Helps anorexia, headache, fear, etc. Throat, lungs, asthma, infections, teeth, TMJ, hearing, high blood pressure, creativity block, depression. Dull, paler, weaker. Works well with Chrysocolla, best with Silver. Used for healing on every continent! Androgynous, balances yin/yang. Fades in sunlight, sweat, oil, dishwater...Avoid bleach/chlorine!